ICA Sports suffered defeat last night (April 12) in the first of their two major cup finals. 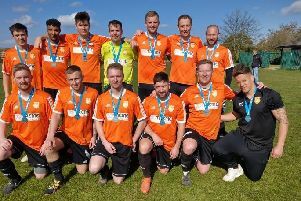 The city side missed out on Hunts Intermediate Cup glory when going down 2-1 to Cambs League Premier Division outfit Eaton Socon in a showpiece clash at a typically windswept Jubilee Park in Huntingdon. ICA hit the front thanks to an astute finish from Harley Williams, who classily clipped the ball over a stranded goalkeeper from a wide position just after the half-hour mark. Only a terrific goal-line clearance from Billy Bennett preserved their advantage 90 seconds later, but no-one could come to the rescue when Eaton Socon threatened again. ICA goalkeeper Adam Mills made a good initial save to deny Lee Bassett, but the ball dropped kindly for the striker to steer in the rebound. ICA were the better side in the second half with the speed and skill of wideman Josh Smith causing problems for Eaton Socon. Smith and Tom Curtis both forced smart saves. But ICA were stung with 13 minutes to go when Bassett, a man with a fine goalscoring record at much higher levels in the past, struck on the half-volley from a seemingly impossible angle. It was a moment of genius worthy of winning any match if intentional, or a freak and fortunate effort if not. Either way, it did settle this contest. “We felt sure it would be an even game after having Eaton Socon watched,” said Curtis. “We gave them a bit too much respect in the first half, but after the break we pressed them further up the pitch. “We could have been tidier with the ball in the final third, but we still forced a couple of good saves and had a ball cleared off the line. “Eaton Socon had one shot on goal in the second half, if you can even call it a shot, and it has looped in and ended up deciding the game. “The lads all enjoyed playing in the final and hopefully people left thinking that ICA is a good club which represented itself well. Defeat last night does not end ICA’s hopes of silverware this term. They are also through to the PFA Senior Cup final, which is being staged at the ABAX Stadium on May 15. ICA Sports squad: Adam Mills, Billy Bennett, Lewis Glover, Nathan Glover, Simon Farrow, Stephen Wells, Connor Pridmore, Vaidas Macianskis, Thomas Curtis, Harley Williams, Josh Smith, Daniel Elvestad, Kane Gilbert, Doradon Pjetra, Jordan Buckingham.